Post back data is not the only thing that you may want to deal with in your custom controls. You may want your control to cause a post back and raise some server side event such as Click or SelectedIndexChanged. Handling a post back event requires that your control implements IPostBackEventHandler interface. In this article I explain how that can be done. The PaisePostBackEvent() method gives you a chance to raise a server side post back event (e.g. Click or SelectedIndexChanged). The method receives an event argument parameter of type string which may contain event argument data if any. Let's create a simple custom control that implements IPostBackEventHandler interface and raises Click event upon post back. Begin by creating a new web site in Visual Studio. Add App_Code to your web site and further add a new class named GraphicButton. The following code shows the class definition. Here, you create a class named GraphicButton that resides in BinaryIntellect.UI namespace. The GraphicButton class inherits from WebControl base class and implements IPostBackEventHandler interface. The constructor of GraphicButton class calls its base class constructor by passing HtmlTextWriterTag. This indicates that your control builds over <SPAN> tag. Now add two public properties viz. ImageUrl and Text to the GraphicButton class. The Click event is raised when user clicks on the image rendered by the GraphicButton control. Now override the RenderContents() method of the WebControl base class and emit the required markup. Finally, implement the IPostBackEventHandler interface by writing RaisePostBackEvent() method. 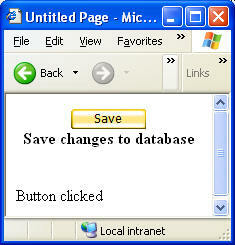 Here, you simply raise the Click event of GraphicButton control. Also create an instance of the GraphicButton control on the web form. The following figure shows a sample run of the web form.